Peel cucumbers. Cut into pieces and place in a food processor with the lime juice, ginger, sugar and sea salt. Process until mixture is smooth. Chill. Place in an ice cream machine and follow the instructions for the machine to churn the sorbet. Once it is churned, transfer to a plastic container with a lid and freeze. When ready to serve, remove from the freezer for 5-10 minutes and scoop into serving dishes. Tip: A sorbet is traditionally served between courses to cleanse the palette and this recipe is perfect for this purpose. 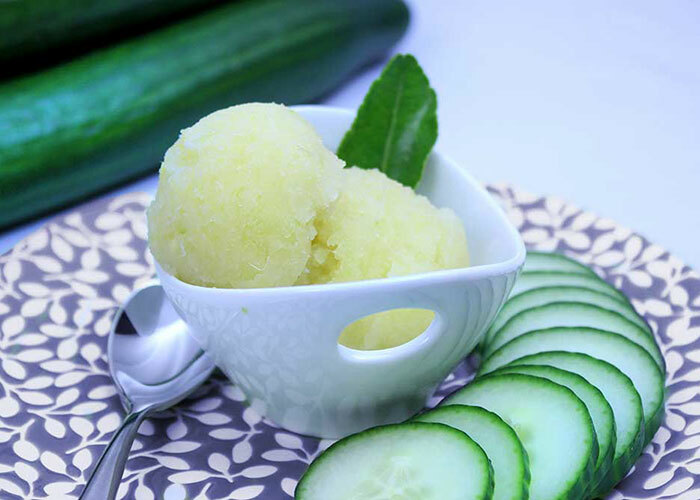 This sorbet also makes a delicious snack on a hot summer day. Note: Artificial sweeteners will not work well in the recipe.